Attorney Paul Erspamer, at Paul M. Erspamer Law Offices, S.C., provides dedicated workers' compensation law services for his clients from his Wauwatosa, Wisconsin, practice. With nearly three decades of legal practice, his clients get the benefit of his vast experience and knowledge of the inner workings of Wisconsin's workers' compensation legal system. MoreAttorney Paul Erspamer, at Paul M. Erspamer Law Offices, S.C., provides dedicated workers' compensation law services for his clients from his Wauwatosa, Wisconsin, practice. With nearly three decades of legal practice, his clients get the benefit of his vast experience and knowledge of the inner workings of Wisconsin's workers' compensation legal system. Mr. Erspamer appears on behalf of his clients in the Wisconsin Workers' Compensation Division and the Wisconsin Labor and Industry Review Commission. He further practices in Wisconsin circuit and appellate courts. At times, unfortunate work-related injuries cause a client to be unable to return to any type of full-time work. 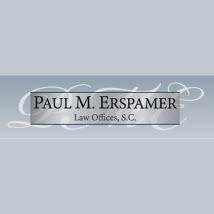 Paul M. Erspamer Law Offices, S.C., also provides diligent Social Security Disability representation at the federal level, so the client leaves no benefits on the table. Mr. Erspamer is a recipient of the Advocate Award for the American Association for Justice. He speaks on workers' compensation and SSDI matters at continuing education seminars in his community on a regular basis. The law office offers free initial consultations and accepts credit cards. However, it only charges its workers' compensation and Social Security Disability clients if Mr. Erspamer successfully obtains an award for them. The law office also provides evening and weekend appointments by prescheduling, for those clients who request them. Former President of Board of Directors, "BIG BROTHERS & BIG SISTERS OF DODGE COUNTY, INC.
Former President, "OPTIMIST CLUB OF WATERTOWN, INC."